In Musicnizer, you can rate your music albums and individual songs. As of this writing, the two ratings are to be set independently. In the lower part of the window, all tracks of the album are displayed. In the "Rating" column, click stars to set rating. One star is one point, so your rating can be from 1 through 5. In the "Edit info" window, you can also rate the entire album. 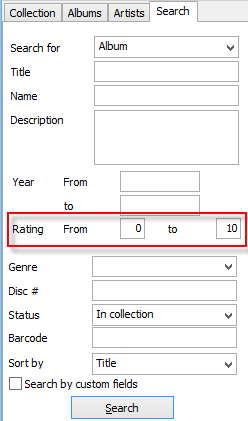 Just enter a value from 1 through 10 into the "My rating" field on the left. The album rating is displayed under the cover art, on the left ("My rating"). Here you can also change it by clicking the stars. Each star represents two points, so each half of a star can be clicked separately. On the "Search" tab, rating values can be used as a part of a search request. 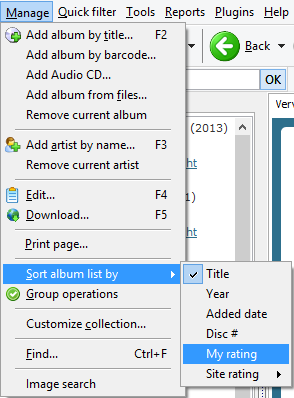 Besides the described options, album rating is also available on the "Collection" tab and in Reports. In addition to showing exact rating values in Reports, Musicnizer can build reports with your albums sorted by rating.